My eight weeks in Derry had seemed to have come and gone in the blink of an eye and before I knew it, we were all packing up our belongings once again for our week long field study in Dublin before heading back to the University’s Coleraine campus. It was a very bittersweet last week because although I was beyond excited to head down to Dublin as well as having the whole group reunited once again, it was extremely difficult to say goodbye to a city that I had become so familiar with and made so many memories in. People had actually started asking me for directions to places around the town and I was able to tell them how to get there with confidence despite the look of doubt they had on their faces once they heard my American accent. 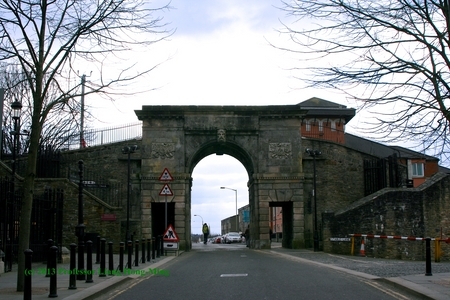 And to this day I still miss this place more and more, everything from the people with their stories and their Derry accents to something as simple as walking down Strand Road into the city center or taking a ‘wee dander up the walls’. Though the goodbyes were difficult and that I could’ve spent months in Derry, it was time to see and learn more and try to get a better grasp on the conflict and the peace process from the perspective of those down South. So with that we were off to the Republic of Ireland to act as both tourists and students, we would hit all of the main tourist attractions as well as take advantage of the opportunities that come with being a HECUA student and that was something to look forward to. During my time in Northern Ireland, Margaret Thatcher had passed away. Margaret Thatcher, as you may very well know, had been a prominent figure in the world but in Great Britain in particular. My impression of her prior to my semester abroad was based on the very few tidbits of Meryl Streep’s portrayal of her in the movie The Iron Lady, so I had viewed her as a strong woman and a tough politician. I knew essentially nothing about where she stood politically other than she and Ronald Reagan had been friends, but that all changed the day she died as I heard countless opinions from others about her. Thatcher came into the position of Prime Minister in the midst of the Troubles and it is believed by many that she further divided political opinions in Northern Ireland. Unionists typically view her in a similar way as Northern Ireland First Minister Peter Robinson as ‘one of the greatest political figures in post-war Britain’. The opinions of most nationalists is based off of Thatcher’s ‘shameful role during the epic hunger strikes of 1980 and 81’ (Sinn Fein leader, Gerry Adams). Irish nationalists view Margaret Thatcher as a murderer, holding her accountable for the ten deaths that occurred during the strikes. 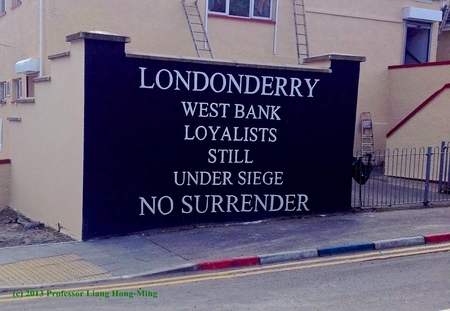 Having been living in Derry (again, where the population is about 90% Catholic nationalists) at the time of her passing, it was reminiscent of the day Osama Bin Laden had been killed but times ten. It was like a week-long celebration for a lot of the locals which had meant an increase in sectarian activities. This included a party at the Free Derry corner in the Bogside that would serve free cake and milk following the burning of a Margaret Thatcher effigy as well as multiple attacks on the Fountain Estate (the tiny Protestant loyalist/unionist community). The attacks on the Fountain hadn’t been all that shocking, it had actually been anticipated and it was apparent as there was also an increase in the number of the armored police ‘cars’ (which look more like a storm chasers vehicle) rolling around. However, what was shocking who had been carrying out the attacks. Many of the bombs being thrown were being thrown by the hands of children as young as five years old, reinforcing the need for the organizations we had interned for. 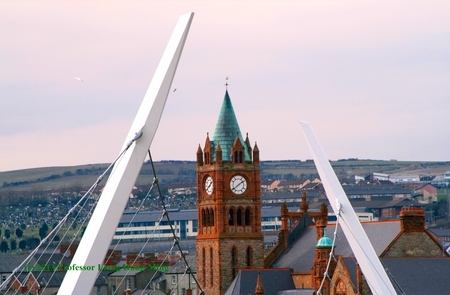 As I mentioned in a couple of my previous posts, my HECUA group had toured two different cities that we would eventually split off and move to for our internship portion of the program, half in Belfast and the others Derry/Londonderry. I happened to be in the Derry-group and would intern for the non-profit organization called ‘Headliners’. 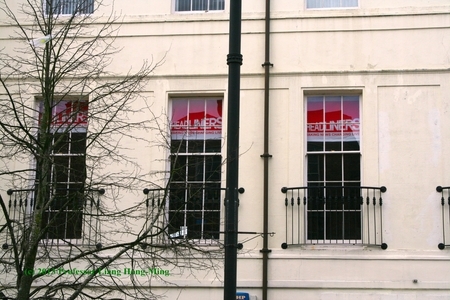 Headliners is just one of many organizations aiding in bringing Northern Ireland to a more peaceful future, but what makes this organization unique is who they work with. Headliners works predominantly with children and young adults and during my time at there, I worked with 8-year-old kids, 19-year-old young adults, and all those in-between. Because Northern Ireland has sectarian history, a lot of Northern Irish people that I had met said that in general, N. Irish don’t meet someone of the opposite religion until they go off to university, making it easier to dehumanize the ‘other’. So the main objective of Headliners is to bring youth from different backgrounds together by having the Catholic and Protestant schools congregate in hopes they would recognize that the ‘other’ isn’t all that much different from them. To help these kids come to realize the similarities within the two communities, Headliners has them collaborate on a variety of different media projects whether it be recording a radio podcast, writing pieces for Headliner’s magazine, or photography and videography endeavors. At the end of the program, Headliners hands out an evaluation form that the kids would fill out, giving the organization some feedback on what’s working well and what may need some adjustment. It was interesting to see how much these kids either enjoyed working with Headliners as well as the ‘other’ or if they had been uncomfortable with the mixing of what to Northern Ireland refers to as ‘ethnicities’. 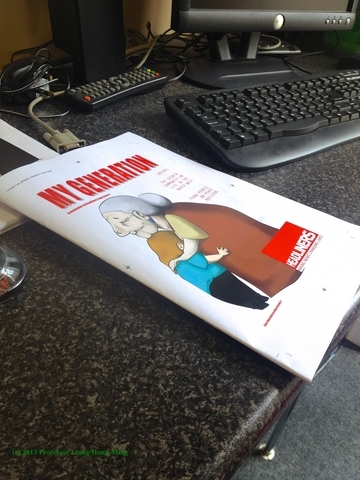 Photo 1 of the now published magazine we (at Headliners) were editing at the time. As mentioned in my last update, the group had ventured to Derry/Londonderry for the first of our three field studies. 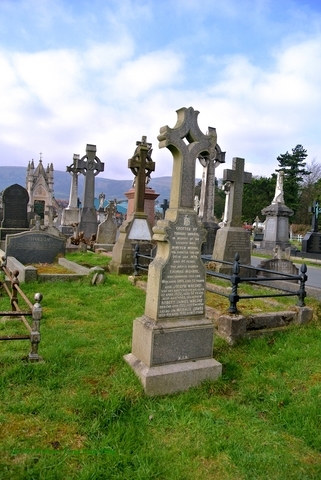 The second field study took place in Belfast famous for being the birthplace of the Titanic. However, our purpose in Belfast was to focus on what we came to Northern Ireland for, to learn about democracy and social change in Northern Ireland. Because this was our focus and we were studying under the HECUA program, we were presented with so many different opportunities that we otherwise would’ve missed out on and a couple examples of this were presented during our day in Belfast. We spent different parts of the day with three different men who played significant roles in the Troubles. All three men had once been a paramilitary (two IRA men, one UVF), all three had committed shocking crimes, and as a result, all three had received a life sentence in prison. But these guys were roaming Belfast freely because of the Belfast/Good Friday Agreement of 1998, which had released all those imprisoned for committing crimes because of the Troubles. Prior to meeting these men, I was expecting to meet hardened criminals, but that’s just the opposite of what I saw. As they discussed the crimes they had committed and their experiences in the prison, I was almost in disbelief. I was anticipating monsters, but these former paramilitary members were so normal and that was kind of the theme of the day. They dehumanized the people they had murdered and bombed, they didn’t see the ‘other’ as being people. Now having been granted a second chance, these three men are doing what they can to put an end to the sectarian violence and trying to encourage the younger generations to not get involved in the violence. Although all three are hoping for a more shared society and peaceful future, they are still deeply set in either wanting to remain apart of the UK or having a strong desire to reunify Ireland. 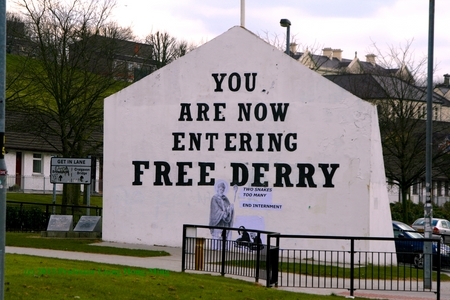 Having been abroad for about a week and a half, I still hadn’t encountered much culture shock due to our intensive learning on the history and politics of Northern Ireland. It wasn’t until we got out of the classroom for two ‘orientation’ field trips. These field trips were taken in the last week of classes before our group was to split in half and divide between two major cities of the tiny country for the internship segment of the program. It was during these field trips that the culture shock had finally arrived. 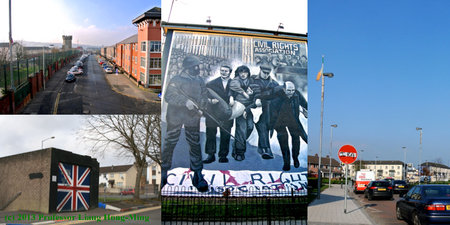 Our first field trip was to the city of Derry/Londonderry, home to a significant event of the Troubles, Bloody Sunday. 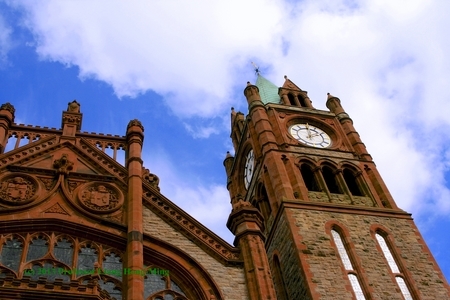 Derry (as the Irish Catholics would refer to the city) is home to a predominantly Catholic Republican population, however, there are certain parts of town that are especially Catholic Republican, one of them being the Bogside (the part of town where Bloody Sunday took place). 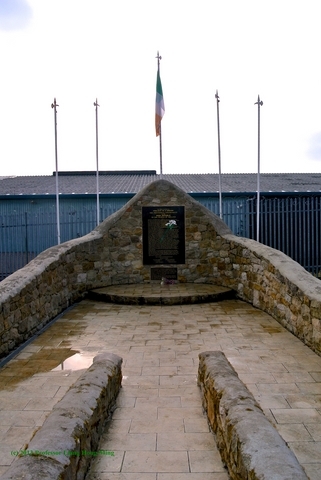 In the Bog you would find a plethora of Irish Tricolor flags, Irish Republican Army (a revolutionary military organization commonly called the IRA) graffiti and more importantly some of the infamous political murals. Then we went to another side of town called the Fountain Estate. 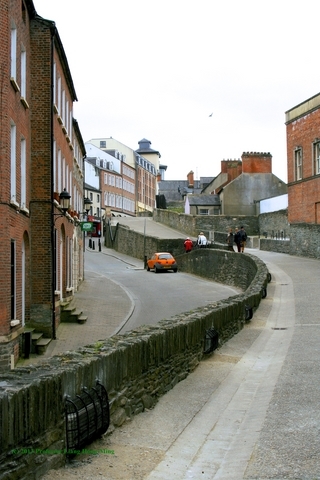 The Fountain is the miniscule Protestant neighborhood on the city side of the town they’d call Londonderry. 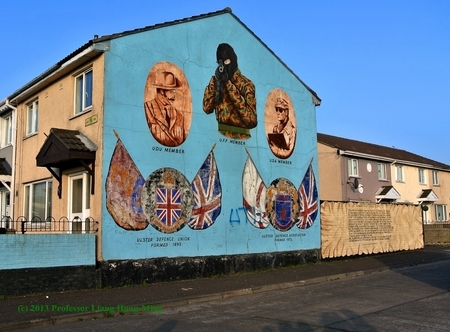 Here you’d find the red, white, and blue of the Union Jack on all corners of the wall surrounding this Protestant community. This wall was the most shocking thing I had seen. We had learned about them in class, but there’s nothing like seeing it for yourself. These walls (called ‘peace lines’) had been constructed as a means of protection. Because there’s such a small Protestant population, they have been the targets of Republican violence (paint bombs, petrol bombs, shootings, etc.). 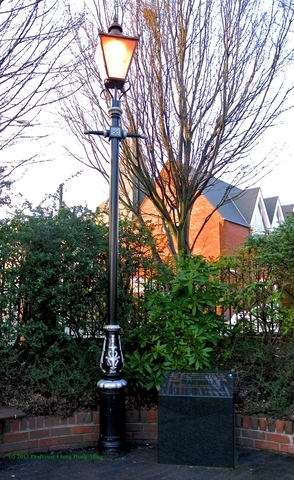 Although the Fountain doesn’t see nearly as much violence today, the Protestant community does not yet feel safe enough to have them torn down. How’s that for culture shock? The Middle Ground Journal will share brief dispatches from our North Star Project student interns, particularly from those who are currently stationed, or will soon be stationed abroad. We have confirmed student interns who will be reporting from Mongolia, Southern China, Shanghai, northeastern China, The Netherlands, Tanzania, Ireland, England, Finland, Russia, and Haiti. We also have students developing presentations on theatrical representations of historical trauma, historical memory, the price individuals pay during tragic global conflicts, and different perceptions of current events from around the world. We will post their dispatches here, and report on their interactions with the North Star Project students and teachers.